Here’s an interesting tidbit that was unfortunately lost in the iPhone flurry this morning: some internal sales stats have apparently leaked from within Amazon, revealing that the new Fire tablet has some extremely impressive numbers. We saw some numbers a day or two ago but the source didn’t seem reliable — these seem a little more trustworthy. So what are we looking at? Well, in the five days after its launch (which is to say, from its launch on Wednesday until Sunday or possibly Monday), the modestly-specced, inexpensive tablet has accumulated over a quarter of a million pre-orders. Now, comparing the Fire to the iPad in features and specs is a bad idea, but comparing sales numbers at the very least gives you an idea of scale. The iPad 2 sold 2.5 million or so in its first month, which works out to something like 80,000 per day on average. The Fire is a bit below that at ~50,000 per day, but compare that with other non-iPad tablets and I think you’ll find the Fire is putting on an impressive show. More impressive than its e-ink counterparts, perhaps: the new e-readers don’t seem to be flying off the shelves just yet. It’s possible that Amazon swung too late, what with Barnes and Noble and Kobo already having snatched up a lot of the “advanced e-reader” crowd. 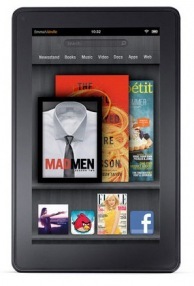 According to the same source at Amazon, the Kindle Touch sold ~32,000 units (Wifi and 3G) during those same five days. I’m certainly not saying that’s a poor showing, but it is a little pokey. If you’re on the fence about whether to try out Amazon’s small wonder or buy large with the iPad 2, just hang on for a few: we’ll have our full review up as soon as we’ve spent some time with the device, and hopefully we can make your holiday shopping a little simpler. In the meantime you can check out our hands-on here.